It’s Not Too Late to Change! This past week was pretty awesome! Our district got approved by our mission president to attend a soccer game saturday evening which was super exciting especially since it was the first game i have attended in a big stadium. It was South Africa’s national team (Bafana Bafana) versus the Gambian National team. Sadly though no one scored but it was still a great experience. Maybe when i get home i will attend some more soccer matches. Our week with the work went really good as well. It feels like my companion and i are being blessed with everything that we do. This sunday we had another two investigators walk into church and say that they were ready to start receiving lessons. One of them stayed for our baptismal service which my companion and i held after church and he told us that he wants to be baptized as soon as possible. Again i am super grateful for all that Heavenly Father has blessed us with. Also we had a baptism this week but sadly we had no time to take any pictures. But it was super interesting because the woman who we baptized is 78 years old. One of her grandsons was giving the talk on baptism before the actual ordinance and he said in his talk “i never thought that you gogo (grandma in zulu) would be baptized in your old age!” I wanted to laugh a little but again i didnt think it was a very funny joke. People are entitled to change at any point in their lives, so really it doesnt matter at what point they receive the gospel, They just have to receive it with a willing heart. Also because of her age i was asked to help my companion with the baptism which again was a blessing. As he baptized her my job was to stand behind, catch her by the back and make sure she can stand up on her feet. I loved it haha! So now when i speak of that baptism i can say my companion and i both literally baptized her. But im still doing great. Tomorrow at 7 am we have a zone conference with Elder Stanly G. Ellis of the First quorum of the seventy which i am looking forward to. I hope you people have a good week!! 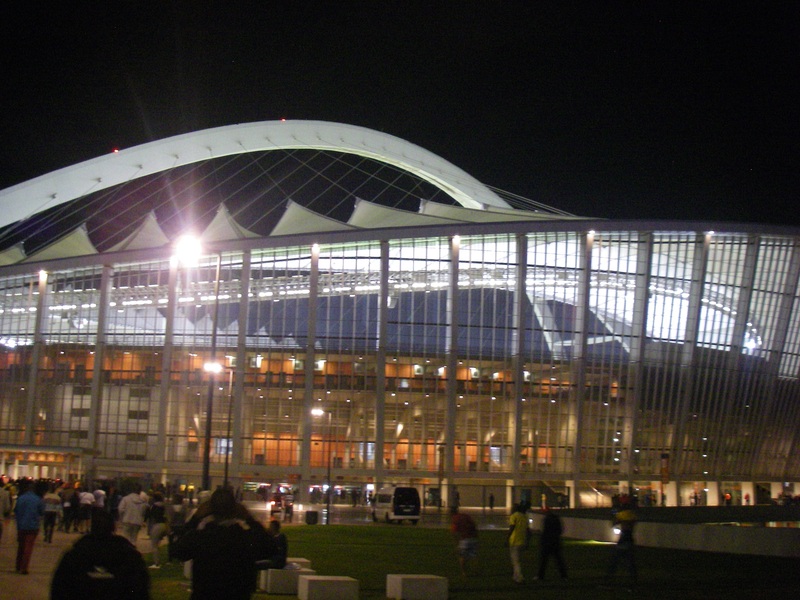 The soccer stadium at night, lit up for the big game! 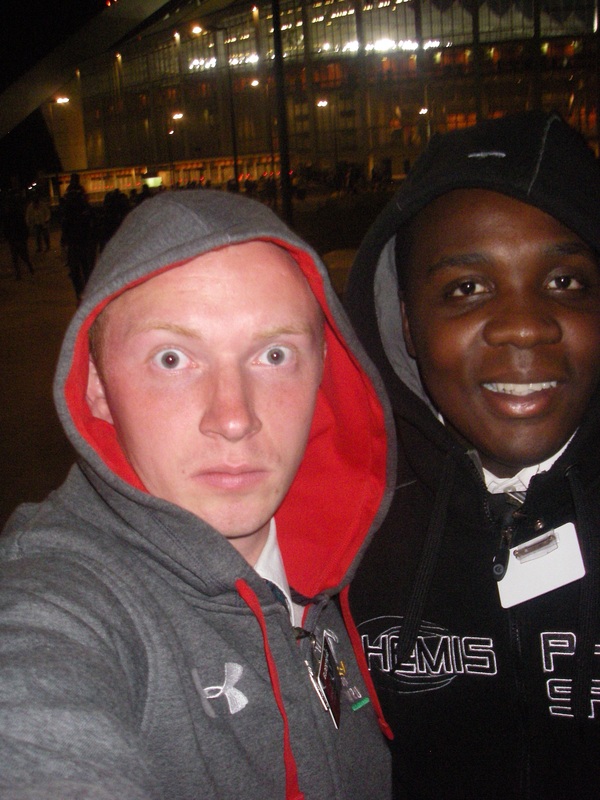 Elders Payne and Ncube at the game! 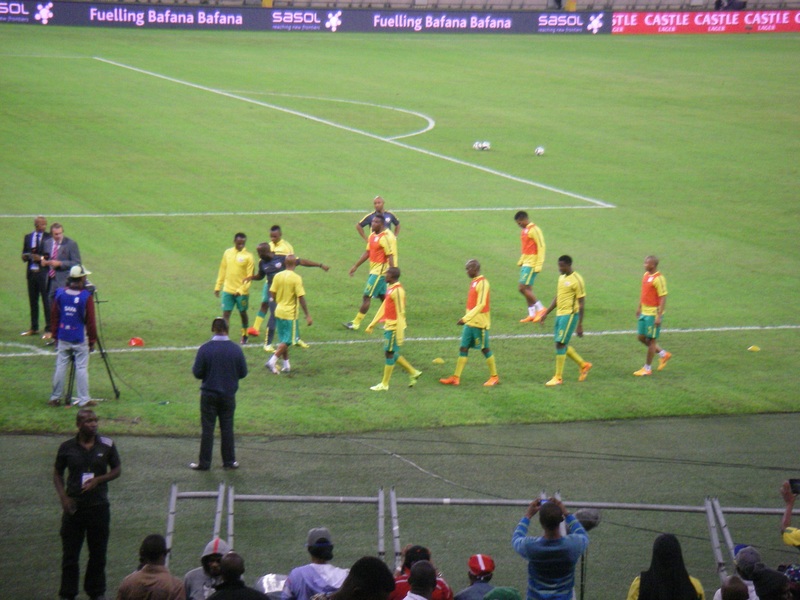 South Africa’s national soccer team (Bafana Bafana – yellow and green jerseys) versus the Gambian National team on the soccer field. Previous PostAn Awesome Investigator!Next PostWe Need Both Legs!